Walkers shortbread now makes three gluten-free flavors: classic butter shortbread, chocolate chip shortbread, and ginger and lemon shortbread. Walker’s gluten-free shortbread. I should really just stop there. I’m assuming you’re already calling your grocery store to see if they have any in stock. Walker’s shortbread has always been my favorite packaged cookie. They taste of butter and crumble in the mouth softly. Even when I was a kid, I knew that almost every cookie that came in a bag or box was artificially flavored or strangely made, since they tasted nothing like the cookies my mother made from scratch occasionally. But Walkers shortbread? I could never make a shortbread as good as their original. Since they’ve been making these cookies in the Scottish highlands since 1898, they clearly know what they are doing. So when I found out that Walkers is now making gluten-free shortbread, I was happy to try them. These shortbread taste exactly like the original to me and Danny (and remember, he can eat gluten). Shortbread doesn’t suffer from a lack of gluten. Traditional Scottish shortbread usually contains a portion of rice flour anyway, to give the familiar shortbread texture. This gluten-free shortbread is good shortbread. And we’re happy to say that Walkers is our latest sponsor. When the good folks at Walkers asked us to come up with a recipe using their gluten-free shortbread? You bet. Just another excuse to eat more of their gluten-free shortbread. When we first tasted the ginger-lemon shortbread from Walkers, Danny and I were both elated. I was happy because this gluten-free shortbread sang with my two favorite flavors: ginger and lemon. Danny immediately started thinking about a lemon tart with this as the crust. Really, you can’t go wrong here. 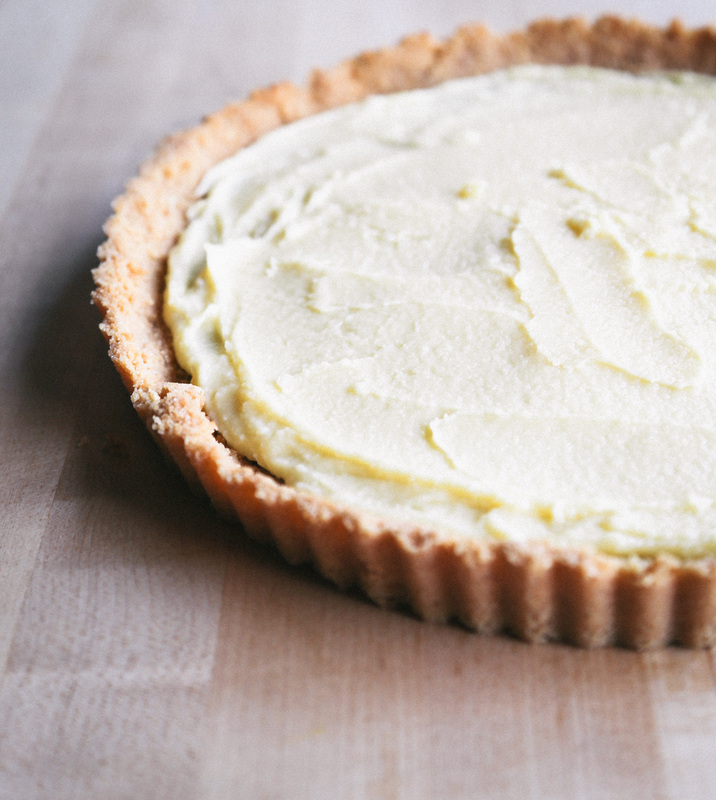 A quick tart crust with cookie crumbs and melted butter, and a batch of homemade lemon curd? Take a few spoonfuls of this lemon curd to enjoy as you stand by the sink, then save the rest for this tart. Trust us. The wait will be worth it. Cream the butter and sugar. Add 4 tablespoons of the butter to the lemon sugar. Run the mixer until the butter and sugar are combined thoroughly and are fluffy, about 5 minutes. With the mixer running, add the eggs one at a time, then the yolks one at a time. Pour in the lemon juice and mix, then the salt. The mixture should be a thick liquid, quite yellow and coherent. Walker’s is happy to give away three packages of the gluten-free shortbread to three readers of this site. Leave a comment about why you would like to win here. Winners will be chosen at random on Friday, March 6th. I love Walkers shortbread and am eager to find these to try. That lemon tart sounds like just the thing to make for our Easter dinner. My Granddaughter just had to go gluten free. Looking for new items and recipes for Grandma to make. This has both ! Now I know where to start and what to look for. I have noticed, on my facebook feed, ads for this. I kind of thought I was dreaming. Will definitely keep my eye out for these as I adore shortbread. Would love to try them! omg walkers shortbread used to be my favorite too! I’m dying to try these! Yummer!! My mouth is watering! Gotta try this one! I’ve been craving a good cookie. I’m definitely looking forward to trying Walker’s Gluten free Shortbread! Your recipe mentions orange flower water in the directions but this is the first mention of it. How much? I made a cheesecake recently with a homemade shortbread cookie crumb crust. This would sure be a lot less work. What is the optional egg in the crust ingredients for though? This is my all time favorite dessert – a real treat to relish. However, since learning of my Celiac Disease, they have been off limits for years. Gluten free is a miracle. Can’t wait to try them. Oh. dear. god. I’ve been wanting to make a lemon tart since my husband went gluten-free ~3 years ago, but I hadn’t figured out what I wanted for the crust. Swooning. Walker’s Shortbread makes my mouth water unlike any commercial cookie can – and I grew up on home-baked everything. Now that celiac has raised its UGLY head, I am always searching for tasty alternatives. I’d perish w/o the gluten free girl and now she is offering this contest! Please oh please. I am a Walker shortbread lover from way back. Remember the tin of cookies you could get around the holidays that had several shapes and varieties? I miss those cookies. So much so that when I heard that the Girl Scouts were offering gluten free shortbreads this year. I bought three boxes, even at their inflated prices. 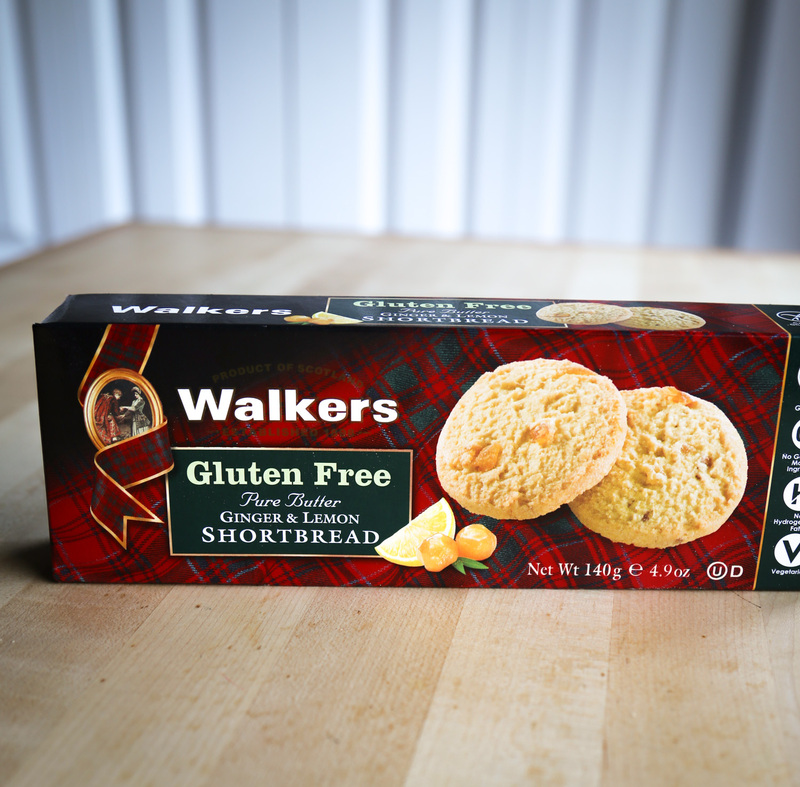 I would LOVE to try Walker’s new gluten free shortbreads. I am sure they won’t disappoint! OMG THIS IS THE BEST NEWS!!!!!!! I would love to try these! I used to eat Walker’s happily until I couldn’t anymore. I’m so pleased to find out that I can eat these again! Wow! I had pretty much given up packaged cookies! They were either cloyingly sweet or dry. I always enjoyed the walkers cookies when I ate gluten. What a special treat! Thanks for spreading the word. These are the Best Gluten Free Shortbread Cookies. They taste just like the originals. I think my heart stopped beating when I read the words Walker’s Shortbread and gluten free in the same sentence. I know I stopped breathing. Yay. I have been looking for a good cookie to make crust with. Prepackaged graham crusts just don’t do it. Would love to surprise my husband, this is his favorite cookie. He just beat cancer and gluten and dairy are not an option for him. He had to give up his favorite cookie and to be able to have them again would be such a wonderful treat. I’m sad to see that they contain the dreaded xantham gum. That knocks them out for me. OMG. I will have to try making this as mini’s as I’m just finishing up losing a lot of weight and mini’s save me..allowing me to still bake but keep tight portion control 🙂 Ty – looks like an outstanding recipe, and I will be sharing this with family and friends. A cookie that doesn’t taste like cardboard? YAH! I’d love to try it. I loved shortbread and have greatly missed it. Especially want to try the Lemon-Ginger version! I bought this shortbread for hogmany in Dumfries. its absolutely delicious and tastes just like proper shortbread should. It was so good, no one else at the party knew it was GF. Looking forward to packs in coffee shops coming (hopefully) soon. This is great news! I had a batch of Meyer lemon curd I’d made the other day & brought it to a party with a couple of boxes of Walker’s shortbread for others to dip and enjoy. I have celiac, so couldn’t share — but am excited to know that I now can. Such an amazing combination of flavors. Walkers shortbread cookies are one of the things I miss most about being gluten free. I love their cookies and am so excited to see I can get gluten free ones! I would love to give these a try! I’m a sucker for the original and anything with chocolate chips is a winner in my book! My favorite! I’ve been to all my local grocery stores and none had them. Do you know if/where these are available locally(Seattle)? I LOVE Walkers!! I am almost believe that GF shortbread they make would be just as good as the original and can’t wait to be convinced. I hope I get some cookies! Not sure what short bread tastes like. It sounds like I’m in for a nice treat! Jean, think of butter and sugar meshed with flour and baked. In this case, of course, not wheat flour 🙂 It’s a delightfully simple cookie in the classic version. Gluten free shortbread! Bless my Scottish heart. I could completely relate to your post! Walker’s Shortbread was always the beloved tea biscuit in our home and we could never come up with a better tasting homemade shortbread. Beyond excited that they have a GF version, and will be trolling stores tomorrow to get my hands on a box or three! Amazon has them. In their description they also state they use no GMO ingredients. Half way there. Now if they will come out with gluten and GMO free version that is also sugar free made with a healthy, natural sweetener like maple syrup or coconut sugar. I would SO make this recipe! Yum who wouldn’t want to try them! Walker’s shortbread cookies, need I say more??? Would love to try them!!!! LOVE lemon curd! Can’t wait to try this one out! How great that there’s another cookie crust option in the gluten-free world now. you have just made my evening. Walkers ginger biscuits were a favorite treat before I had to go gluten free. Reading they can be again is Awesome! I am currently fasting from refined sugar for lent but these shortbread cookies and this recipe seems like the most perfect thing to make for Easter when my fast is over! Loved Walker’s when we lived in Scotland. Haven’t seen the Gluten Free versions in my stores yet. I’ll keep looking. I am making a gluten free cake at every book club night , this looks great! Woot-woot! My kids LOVE Walkers Shortbread (especially the scottie-shaped ones) and now I can make this lemon tart for Easter dinner and my mother-in-law can join in too. So excited! I too LOVE Walkers shortbread. Need to go see if my local stores carry this. Would love to win, but also just happy to know these exist! I’d love to win to have a dessert to eat while my husband eats gluteny desserts!! I have always loved Walker’s shortbread cookies. I had to re read the box twice to make sure that the box I was holding was gluten free shortbreads. They taste exactly the same as the ones with wheat. Even a friend who is not gluten free agreed! Sounds delicious – would love to try them! I don’t have a tart pan – is there another pan that would work? Recipe looks so nice and reminds me of spring! Did the Xanthan Gum in these not bother you? Curious to know as I’m sensitive to it. I’ve never seen lemon curd like that before! Mine is usually a bright, clear , smooth yellow – will have to try your recipe. Maybe I’ve been doing it wrong! I’m really happy to know that Walker’s now makes a GF version of shortbread – I’ve tried baking my own GF shortbread from scratch many times without much success. I’m also curious about the decision process for increasing the egg content/decreasing the butter content from other butter:egg ingredient ratios I’ve come across in the past of lemon curd… is that to lighten the texture? Is baking sugar a special kind of sugar, or powdered sugar, or is it just normal granulated sugar? I’m def. no expert in baking, but want to understand more! I love to bake, but find it more difficult to make gluten-free items that have good texture and taste. I’d love to try Walker’s Shortbread Cookies and the receipe you’ve posted for the Lemon Tart! I would love to win these…because 1) I’ve never tried them! and 2) I have several family members that must eat gluten-free, so I’m always on the lookout for gluten-free treats! Mmmmm, shortbread. Tried making gluten free versions from time to time but never captured that buttery heaven! I thought Xanthum gum, which these contain, isn’t good for a lot us with digestive issues? Do they have a small enough amount that it can be tolerated? Lemon. Ginger. Shortbread. Walkers. Haven’t had good luck with many store-bought gluten-free items, but Walkers conjures up images of Holiday baskets and treating yourself to something special. I can’t wait to try these as soon as I can find them! They sound like a winner. Hope I’m one too. At a time when most packaged foods contain ingredients that most of us cannot even pronounce, we’ve come to appreciate Walker’s Shortbread as a delicious treat that we can find easily and that’s only made with ingredients that you can count on one hand. We have yet to try their Gluten Free offerings, but would love to use them for family holidays when the clan includes several who must eat GF. I am beyond thrilled to hear that Walker’s is making a gf shortbread!!! I used to love Walker’s and am always a little bit sad when I walk by them in the store… And that tart, oh that tart looks amazing! Omg. I love shortbread cookies! It’s amazing the things that you completely put out of you mind as possibilities when Celiac arrives. I would so live to try these! I must figure out where they sell them around me. I LOVE shortbread! Making, eating, baking with…and I especially love Walkers! The Walkers’ G-F Shortbread tart crust recipe is a great way to succeed for someone rather new to gluten-free baking. Being part of a g-f cooking group, I’m going to try this out very soon! I would love to try them! I love shortbread! I want to win so I can make this tart!! oh WoW!!! Sounds divine….Have always being a big fan of Walker’s even bringing back six packet’s from my trip to London last year. With a son recently confirmed celiac and can only imagine the hugh smile on his face seeing this box of shortbread AND being able to eat it!! I am so excited! I’ve missed shortbread cookies since I had to go GF. I would love to win so I could enjoy my shortbread again and make this luscious looking tart! This takes me straight back to the first time I tasted Walkers shortbread on the train from Glasgow to Inverness. I’m excited to be able eat something that is so evocative of my time in Scotland. yum! would love to try these! i love their gluten free shortbread! I am new to all of this having just recently been diagnosed with RA. I have always loved to cook and to bake and am struggling with trying to create a new “me”. I want my grandchildren to think that grandma JoJo bakes just fine, just with more care and precision now because of my new lifestyle. I am anxious to try new recipes and products as I find them. I would so love to win a box of these cookies as I want to make the tart featured in this site. Found a box yesterday and they were so good my hubbie thought that we had gotten a misstake in packaging and had gotten the gluten version. But really they were great. Wow. So excited to read this post because I am in the process of moving to Scotland right now and I didn’t know about these cookies. Also, Lemon Curd is one of my all time favorite things, so you can bet I’ll be making this recipe as soon as I get settled into Edinburgh and get my kitchen set up. Thanks!